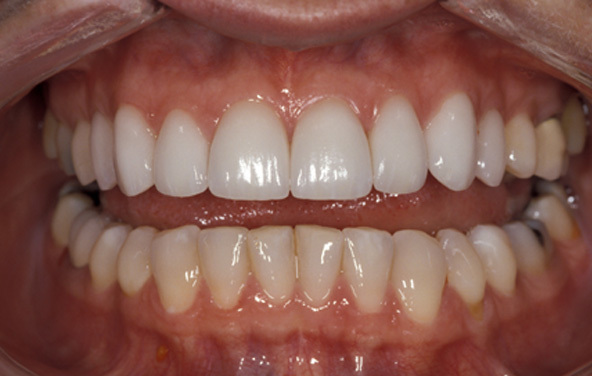 This patient longed to have a pretty, attractive smile. She had very small front teeth and wanted to fill in the gaps. Porcelain veneers were made for her four front teeth. This two-appointment procedure created a wonderful transformation. Because these teeth were small and had been perfectly positioned with prior orthodontic treatment, it was not necessary to grind them. Her “no-prep” veneers are stronger than veneers made for teeth that are badly broken down. 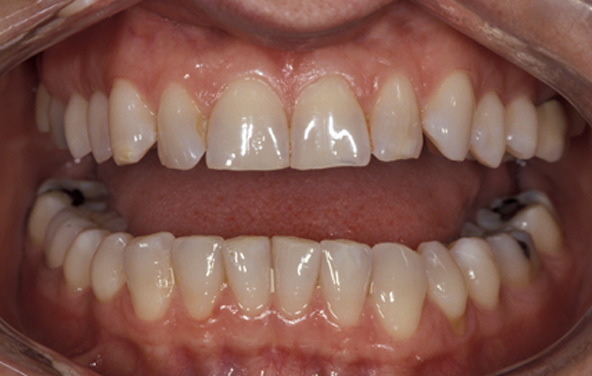 This patient wanted to improve her smile. 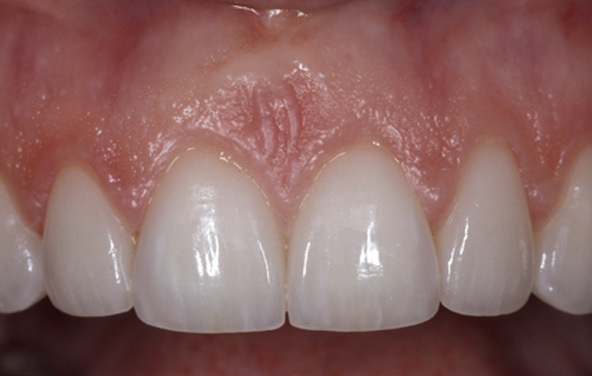 Her teeth were worn and had spaces between them, and her composite restorations were discolored. 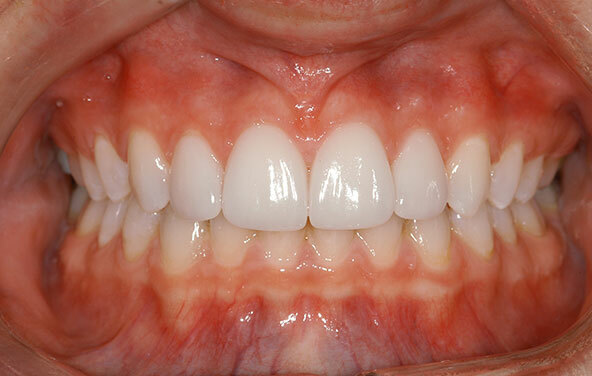 Porcelain veneers were placed on ten upper teeth. 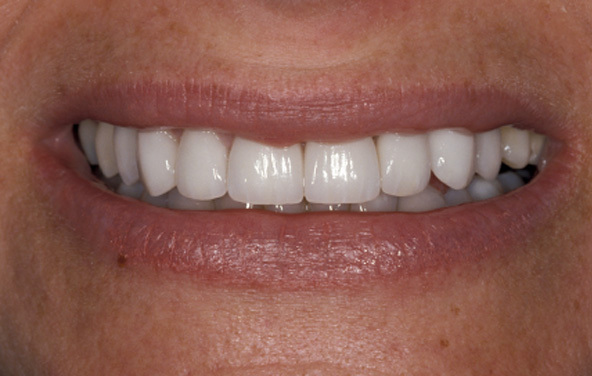 The veneers provided a dramatic improvement to her smile. Our patient is very happy that she made this decision. 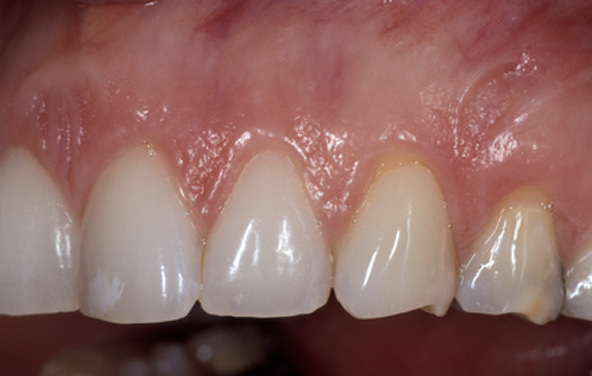 This patient believed her teeth were a detriment to her profession. 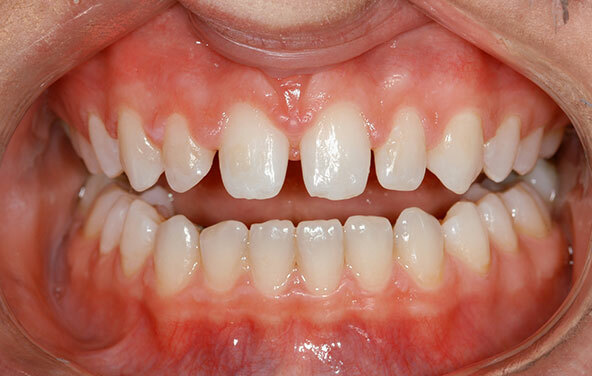 With a prominent public career, this patient came to our office in search of a smile makeover. She was self-conscious that her upper teeth were crowded and yellow. Additionally, her teeth were worn unevenly because of a clenching and grinding habit. Her top priority was achieved — an instant solution. Porcelain veneers were made for eight upper front teeth. They were straighter and whiter in only two appointments. She was absolutely thrilled with the rapid and life-changing result. 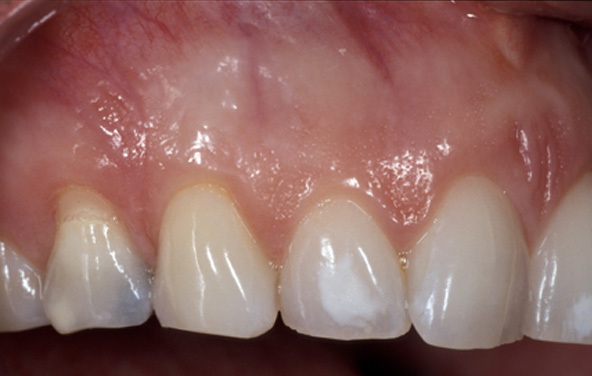 This patient's teeth were rotated and crowded, and had uneven coloration. 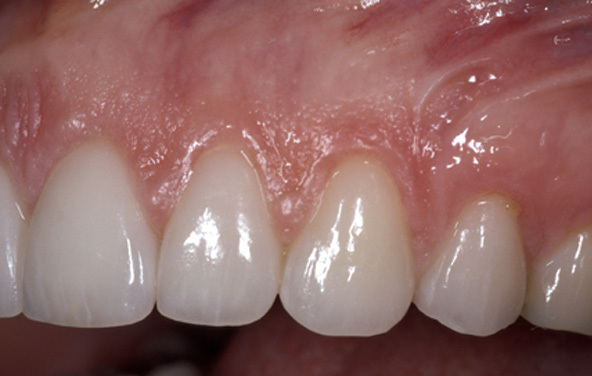 Crowding and rotation often affect the shape of the gum line. Notice that the gum line of the two front teeth is V-shaped rather than being rounded like a "U." 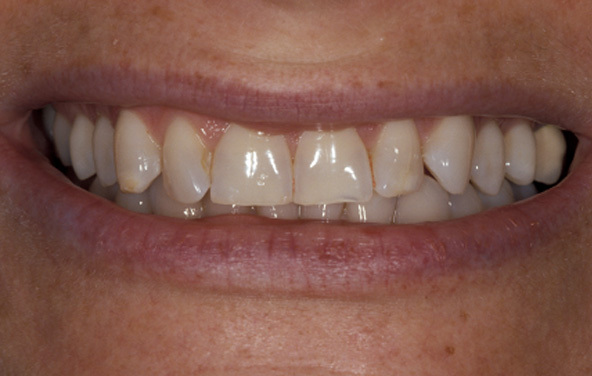 Porcelain veneers made these teeth both brighter and straighter. The gum line is more even and rounded above the two front teeth, producing a startlingly beautiful result. 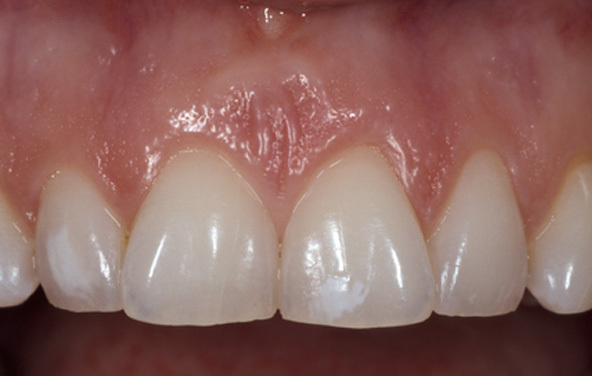 This patient came to us seeking a cosmetic and functional solution. 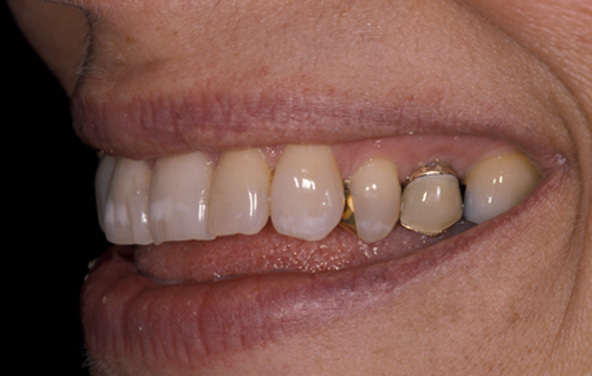 Her potentially beautiful smile was imperfect due to crowding, discoloration and the display of dark metal restorations. 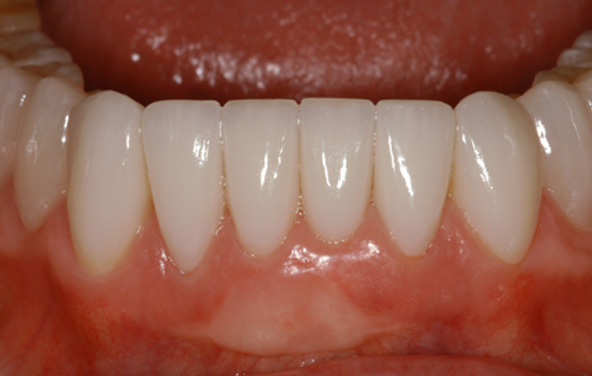 Porcelain veneers were a spectacular solution. They were used to straighten, brighten and whiten her smile. She was absolutely beaming with her beautiful new smile at her final appointment. This patient's smile had issues. His teeth were yellow and crooked, and his gums had receded. This transformation was dramatic. 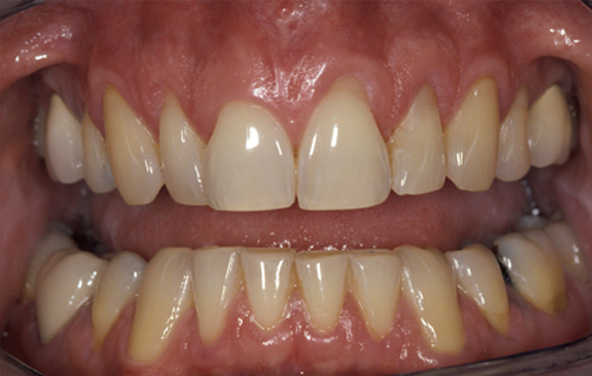 His lower teeth were whitened, and then porcelain veneers were placed on eight upper teeth. At the same time, his gum line was altered by making it more even and uniform. Our patient wanted to improve her smile. Her teeth were discolored and worn, and spaces had occurred between them because her gum line had receded. 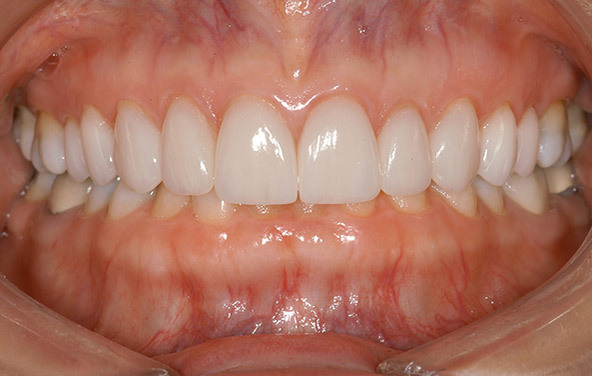 Porcelain veneers were placed on the six front teeth. This improved the color and form, as well as closed the gaps. She was delighted with the very noticeable improvement in her smile. This patient was not happy with her smile. Crowding, discoloration, wear and cavities detracted from her appearance. Porcelain veneers restored health and beauty to her smile. Notice how the contours, translucency, internal characterization and surface texture all contribute to the natural appearance of these restorations. Even under magnification, it is impossible to tell these are restorations. Improved appearance was a major priority for this patient. 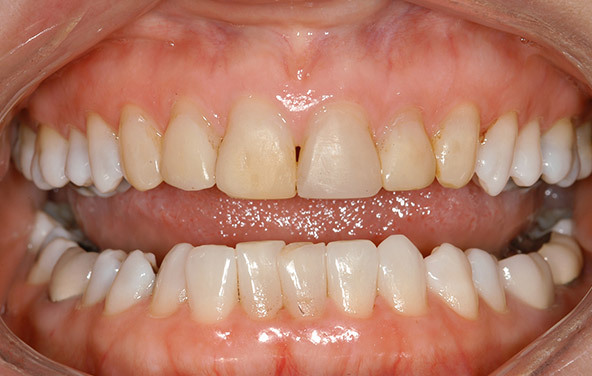 This patient had crowded and dark teeth with stains and areas of wear. 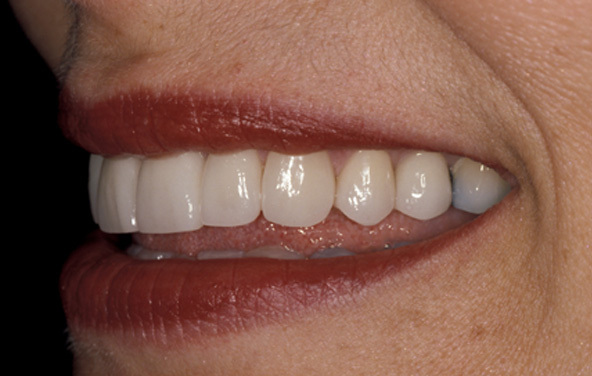 Porcelain veneers provide this smile with beauty and vitality. They do so by masking discoloration while still allowing maximum translucency. 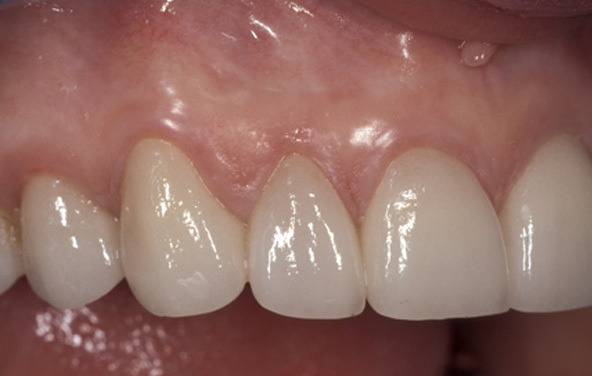 Translucency helps these restorations to blend in and appear natural in all lighting situations. Multiple issues were a concern to this patient. Heavy wear had occurred from this patient's grinding habit. In addition, staining and crowding were a concern for her. Porcelain veneers were the perfect solution. 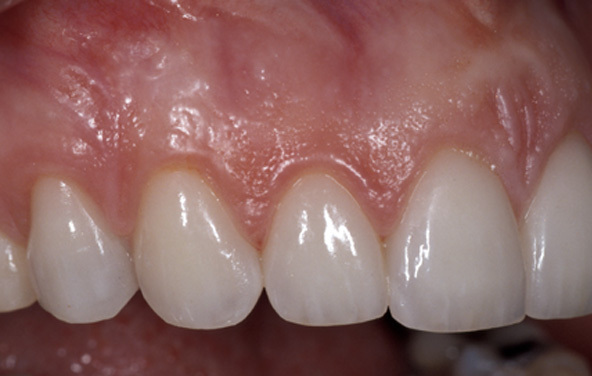 The healthy appearance of the gum tissue contributes to the beauty of these restorations. 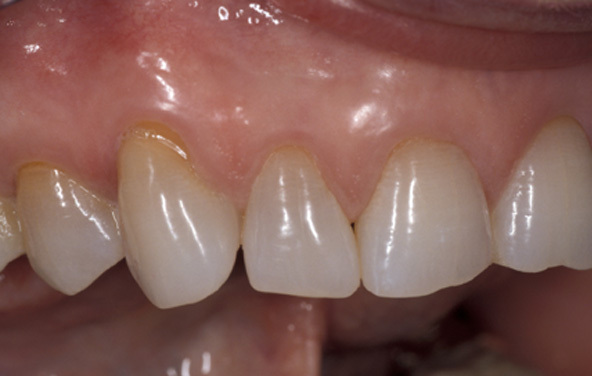 One advantage of porcelain veneers is that there are no metal substructures to darken the gums. No one would ever know that these teeth are not natural. This patient came to us seeking immediate results. 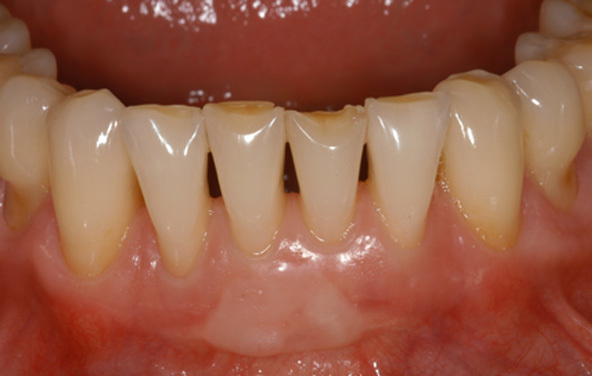 Crooked, stained and worn teeth were a problem for this patient. 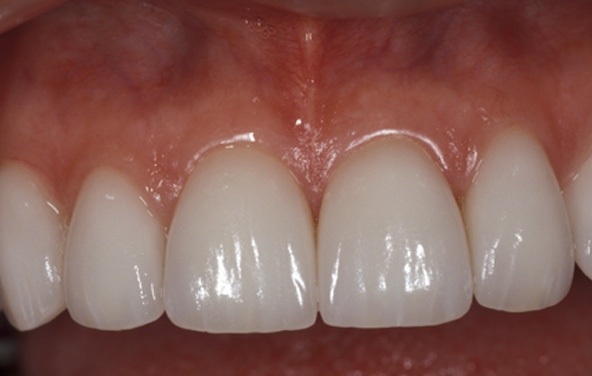 Eight porcelain veneers worked like magic for this smile. Only two appointments were necessary for this dramatic transformation. Several issues were a concern with this case. 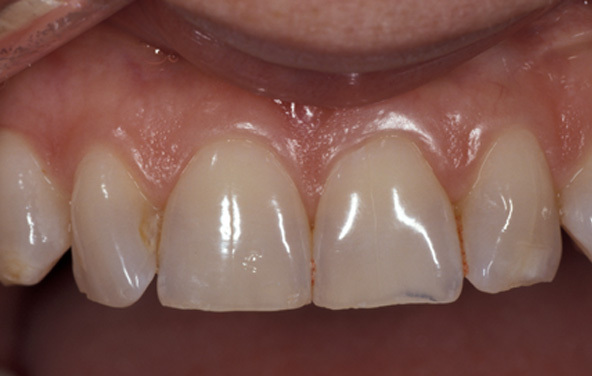 This patient came to us with crooked teeth. Recession of the gum line had exposed yellow root surfaces on some of her teeth. The front two teeth had significant wear and chipping. All teeth had a gray and darkened appearance. Porcelain veneers were the perfect solution. 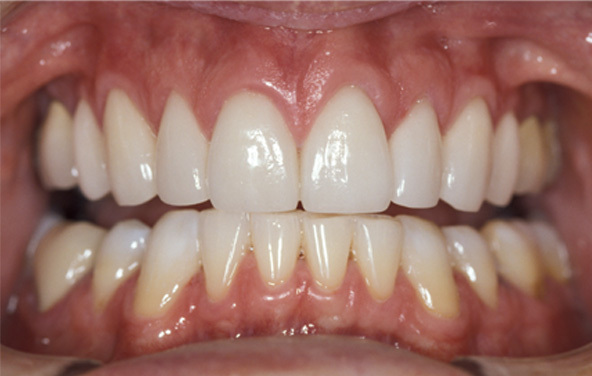 Her teeth became whiter, straighter and more youthful in appearance. This restoration made a significant improvement in her self-confidence.